Mother Nature let her presence be known at Pittsburgh Earth Day—A Citywide Celebration of Sustainability on April 22. Pittsburghers have long celebrated Earth Day but this was the area’s first “unified” event, sponsored by a host of companies, public agencies, and nonprofits. Crowds braved the brisk weather to learn about the environment while listening to local bands and enjoying hands-on activities at the EverPower Earth Day Festival in Market Square, sampling local foods in Mellon Square, and busting some moves at the 422 Pop Up Dance Party on Schenley Plaza in Oakland. Later, Pittsburgh’s own “The Voice” contestant Chris Jamison performed downtown while his grandmother, Barbara Stanko of Butler, could be seen beaming proudly in the audience. 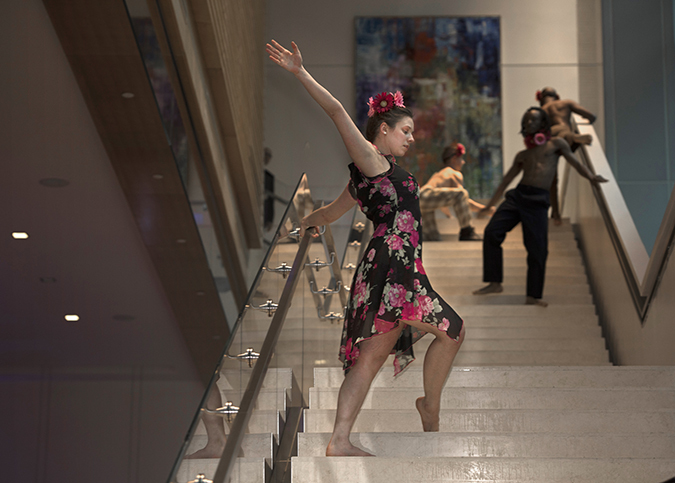 The closing Sustainability Soirée at the Fairmont Pittsburgh featured dancers improvising on the grand staircase and an eco-fashion show. 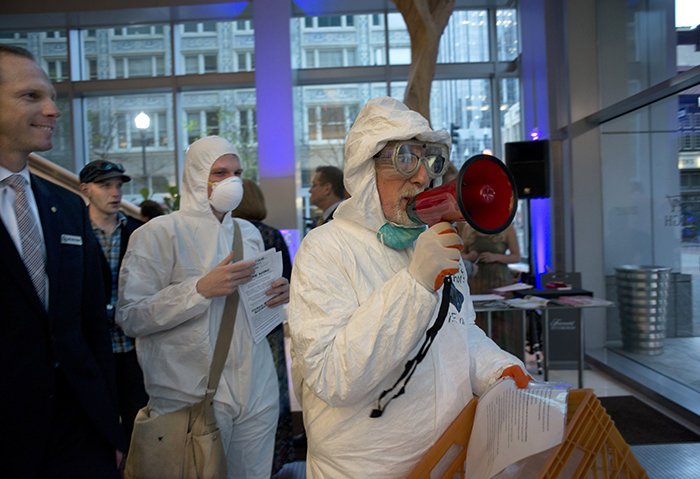 Please click on the photo below to view Martha Rial’s slide show of Pittsburgh Earth Day activities. 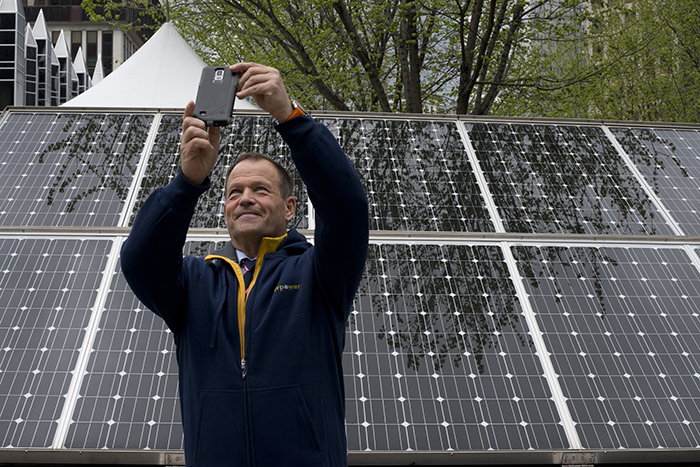 Robert Swan snaps a selfie with the solar panels on display at the EverPower Earth Day Festival. Swan, an advocate for renewable energy and the protection of Antarctica, is the first person to walk to the North and South Poles. 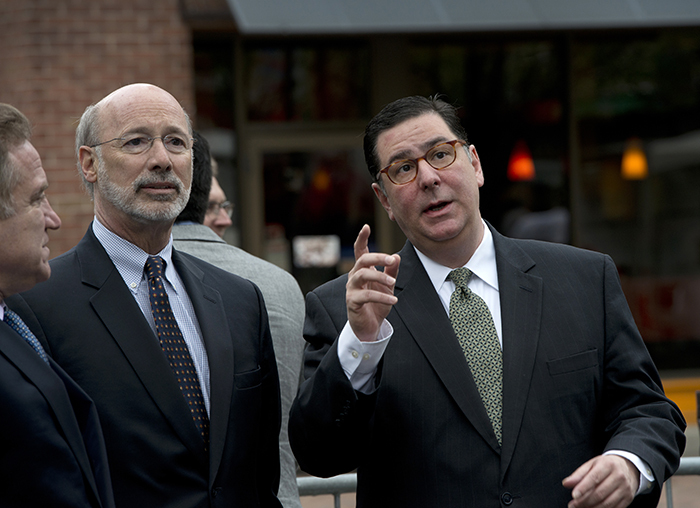 Mayor Bill Peduto (R) points out highlights in Pittsburgh's skyline to Pennsylvania Governor Tom Wolf at Earth Day opening ceremonies. 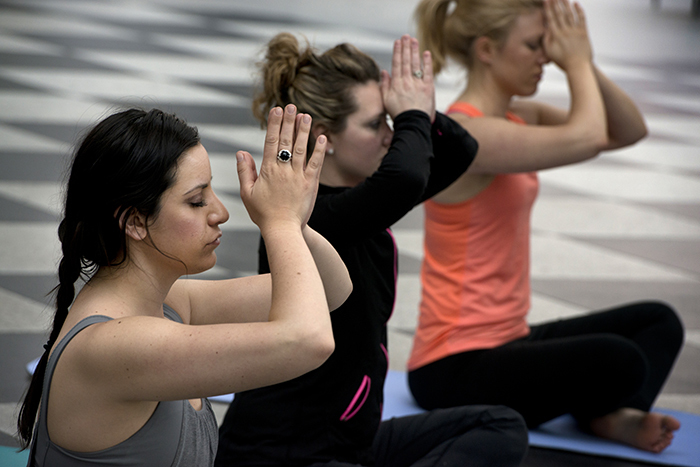 Bridget Sedlock, Tricia Baldridge, and Rebecca Alcorn (L to R) offer salutations after a free session with the nonprofit Pittsburgh Yoga Collective at PPG Wintergarden. 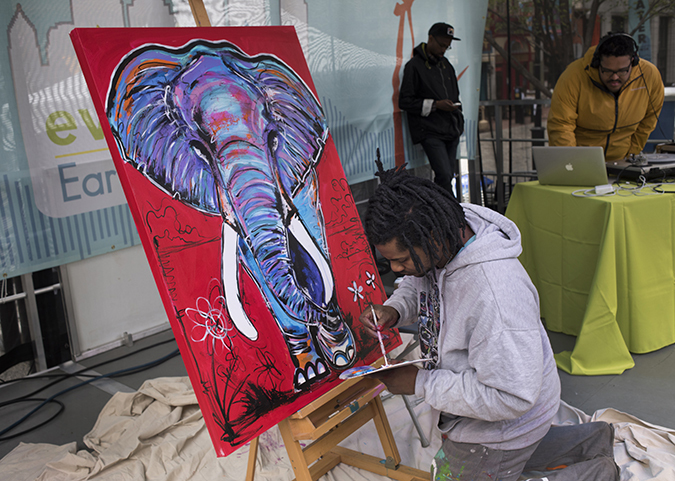 Baron Batch paints a mighty pachyderm while a DJ from the Pittsburgh collective Detour provides the beats. The painting was later auctioned to benefit Tree Pittsburgh. 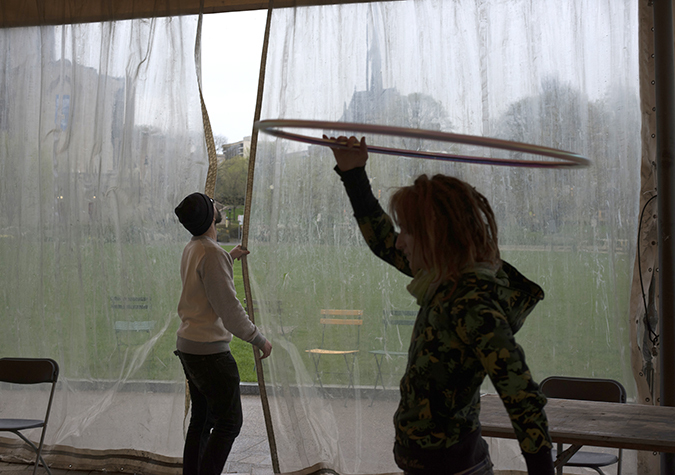 Alex Sadlo, of the Pittsburgh Flow Collective, dances while volunteers adjust a rain curtain at the Schenley Plaza pavilion. 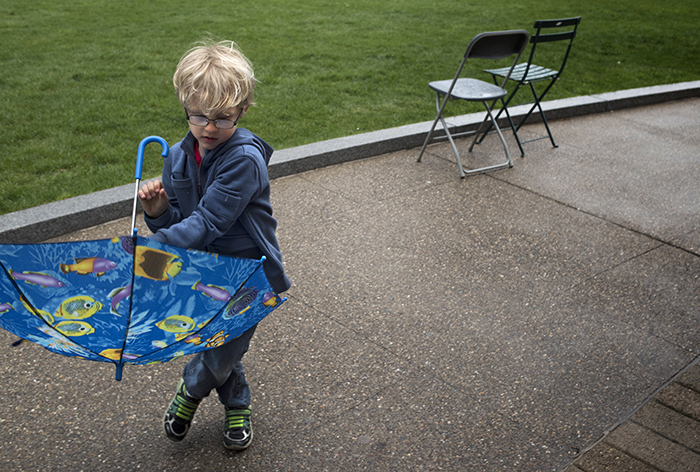 Ira Clemens, age 5, has a fish umbrella and he knows how to use it at the 422 Pop Up Dance Party on Schenley Plaza. 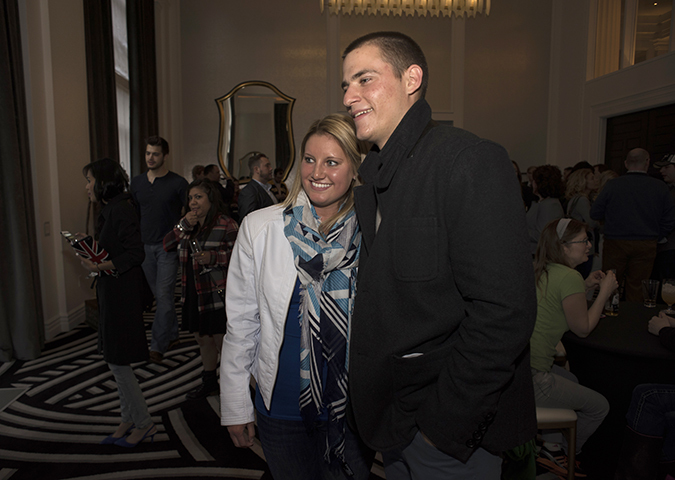 That's superfan Jenna Maine with Chris Jamison during a meet-and-greet at Hotel Monaco. 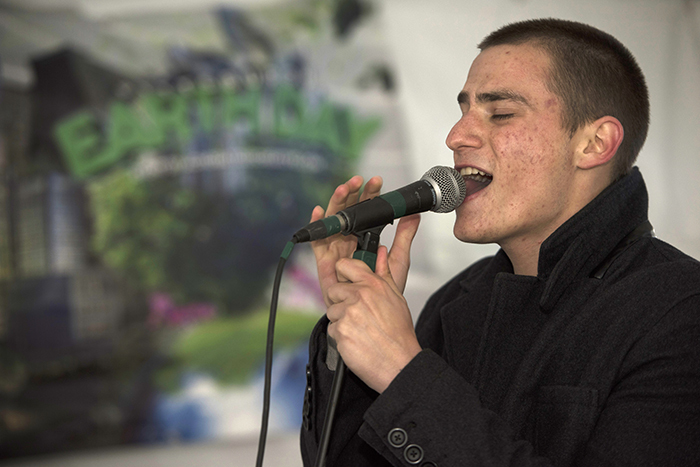 Pop singer Chris Jamison of Ross Township rocks the Maroon 5 hit "Sunday Morning" at Mellon Square. Activist Mel Packer and other members of Three Rivers Rising Tide are escorted out of the Fairmont Pittsburgh after protesting the shipment of crude oil on rail through the Pittsburgh region. Members of the Staycee Pearl Dance Project and The Pillow Project improvise on the steps of the Fairmont Pittsburgh.